Halliburton Company shows why it’s taking the oil market so long to strike a balance despite the fact that the decline rate never sleeps. A lot has been written about OPEC's new strategy to protect its market share over the market price. It was once thought that OPEC would never let the oil price drop too far below $100 a barrel because many of its member nations needed that price to support their fiscal budgets. Therefore, it was expected that it would artificially reduce oil production by turning off its pumps to match global oil supplies with demand. However, it has chosen not to go the artificial route this time, preferring to let the market rebalance naturally. It's a phenomenon that can happen as it's only a matter of time before the natural decline rate of an oil field takes over and production falls, if investments are not made to replace that lost production. That being said, it is taking longer for this process to work its magic than it could because oil producers are still doing whatever they can to keep production flowing -- making some money, after all, is better than making none. Now what you see [above] is... the decline rates for a range...of customers and you see that the average decline rate is around 8%, and this decline rate marches along every single day...And this affects large companies, and it also affects large economies. What Miller is getting at is that a legacy oil field's production will fall by roughly 8% per year if nothing is done to maintain it. In other words, a field that's currently producing 10,000 barrels of oil per day would only produce about 9,200 barrels per day next year if left on its own. The next year, the field would produce about 8% less, and so on until the field runs dry. What's happening here is that as oil and gas are produced, the pressure within the oil reservoir is relieved. With less pressure, it leads to less oil flowing out of a well. So, unless an oil producer drills more wells, or otherwise increases the pressure in the reservoir by flooding it with water or carbon dioxide, the field's production will slowly decline. 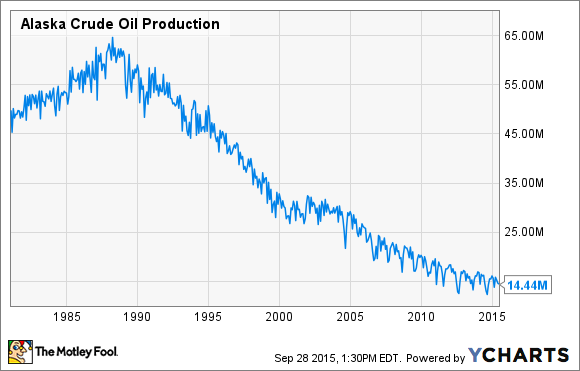 This is largely why oil production in Alaska, for example, has slowly declined since peaking in the late 1980s. In this case, oil companies in the state simply cannot invest enough to overcome the decline rate due in part to the specific nature of its oil fields as well as other region specific issues. The implication here is that as oil producers cut investments to mature oil fields, production will naturally decline. In other words, and more broadly speaking, the currently oversupplied oil market will eventually fix itself without any help from OPEC because of the decline rate. Now Halliburton plays a key role in delivering consulting-led projects to increase recovery by finding bypassed pay (i.e. oil and gas producing zones), oftentimes applying new technology to older fields. And what's important to remember, that in spite of the low commodity price, mature fields, they are more resilient. Now let's put it in the context of oil economies, the bottom line is, that it's better to make any money than to make no money. And so that underpins that whole complex. They continue to work, and they continue to be a meaningful part of our business, particularly in the Middle East, Latin America, and in Asia. What Miller is pointing out is that in spite of the fact that the decline rate of oil fields could lead to a rebalancing of oil supplies, oil companies and oil-producing countries aren't letting that happen. In other words, oil companies and countries are still investing to offset production declines by bringing on new wells because, as Miller notes, they can make more money in the short term by doing this, even if it's prolonging the downturn. The oil market downturn continues to rage on largely because oil producers, particularly producing countries, continue to invest to bring new supplies on line. This is despite the fact that if they simply did nothing, the natural decline rate of an oil reservoir would take over and push supplies lower. Now, that is happening to some degree as U.S. oil production has rolled over, as has production in several other countries, but it would have happened a lot faster if producers would have simply turned off their drills and wait for things to balance out.